To start using RadCollapsiblePanel just drag it from the toolbox and drop it at the form. 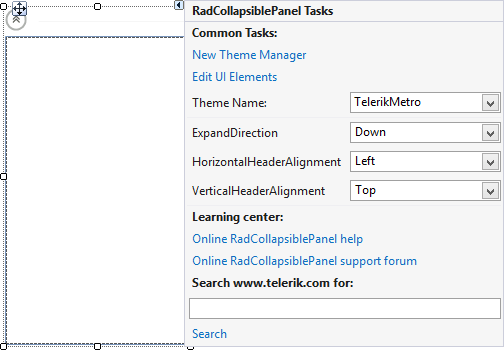 Select RadCollapsiblePanel and click the small arrow on the top right position in order to open the Smart Tag. ExpandDirection: Indicates the direction of the expand animation..
HorizontalHeaderAlignment: Determines how the elements in the header to be aligned when it is in a horizontal position. VerticalHeaderAlignment: Determines how the elements in the header to be aligned when it is in a vertical position. Setting the IsExpanded property in at design time expands or collapses the control without animations.